I managed to get my hands on the latest Ivy Park collection weeks before it landed in-store at Topshop today, and if (like me) you enjoying fusing fashion and sportswear together, then you'll need to get your hands on it, fast. The thing I like most about this second collection from Beyoncé's athleisure label is that it is actually very high-quality performance wear. I hate it when I buy sportswear that looks good but doesn't actually do its job either in the gym or within a day-to-day outfit. 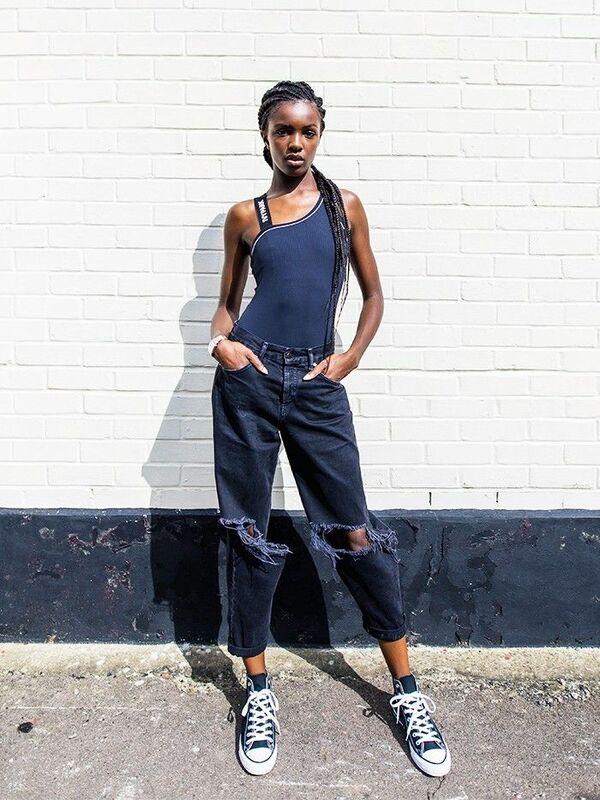 On Leomie Anderson: Ivy Park Asymetrical Bodysuit With Logo Elastic £40. I styled the bodysuit with boy-fit jeans and Converse to show how versatile the piece is. You can go straight from after work drink to a dip in the pool in no time! On Leomie Anderson: (Left) Ivy Park Program Hoodie Navy £32 and Program Runner Navy £16, both available in-store at Topshop. (Right) Ivy Park Dropped Armhole Tank Navy £15 available in-store at Topshop, and Navy Camo Bomber £60. These are the pieces I'd be most likely to use to work out in. Matching items = motivation. On Leomie Anderson: Ivy Park Laser Cut Neoprene Sweat Black £55 available in Khaki, and Full Length Logo Leggings £25. This is the perfect pairing for any lazy day when you want to throw something on but still look good. Go through the gallery below to see more of the collection. Fling over a bodysuit for some major Flashdance vibes. Is it sad that we always want to buy sports bras? It's time for a black legging refresh. This camo won't allow you to hide in the gym! Try layering over a white tee for the weekend. Silver-foil letters add some oomph to a basic. The autumnal colours will ensure you exercise throughout the chilly times. Right? See how to wear the athleisure trend in your office—yes, really. And don't forget to see what Leomie's up to on her blog and Instagram.